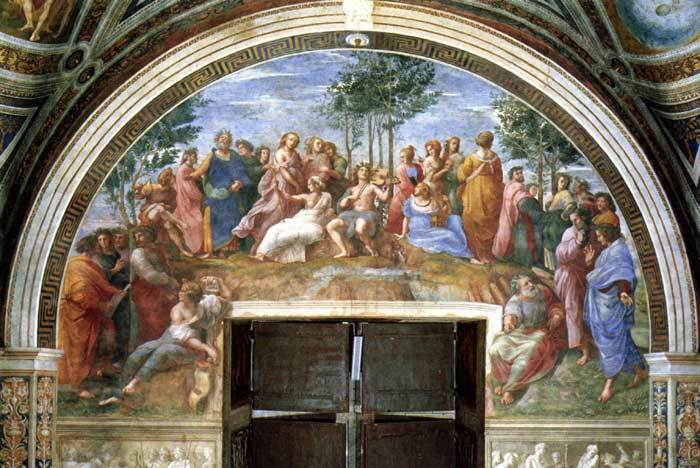 The Vatican Stanze are the apartments of Julius II who gave Raphael complete freedom to fresco the rooms. The rooms had been decorated by several artists previously including, Piero Della Francesca and Luca Signorelli, but Raphael eliminated all previous work and replaced it with his own. The result is one of the greatest painting cycles in the world. 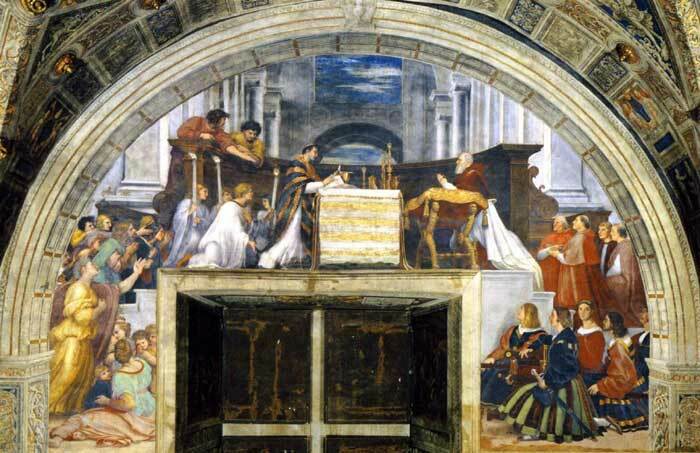 The painting shows two groups of religiously minded people on either side of an altar. They are discussing, rather than disputing, the meaning of Heaven. 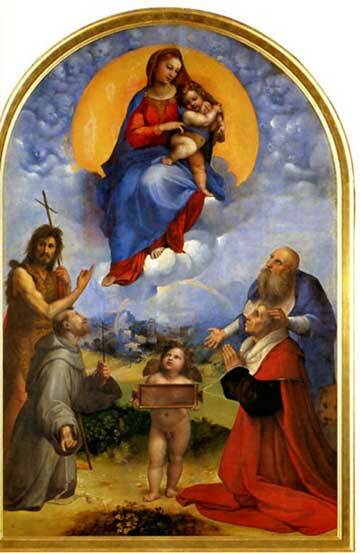 Above them, seated on a cloud, are saints and prophets with Christ in the centre flanked by the Madonna and St John. Note the perspective effect given by the floor as it leads the eye deeper into the picture and the golden light falling from Heaven. Try to see these pictures in the Vatican if you can. The figures are life-size and it is very difficult to appreciate the sheer scale from much smaller reproductions. Spend some time in the rooms and be in awe of the skill, time, and effort required to produce these works. This painting shows musicians with their muses. The figure in blue with his face gazing at the sky represents Homer, and Dante is seen in profile next to him. 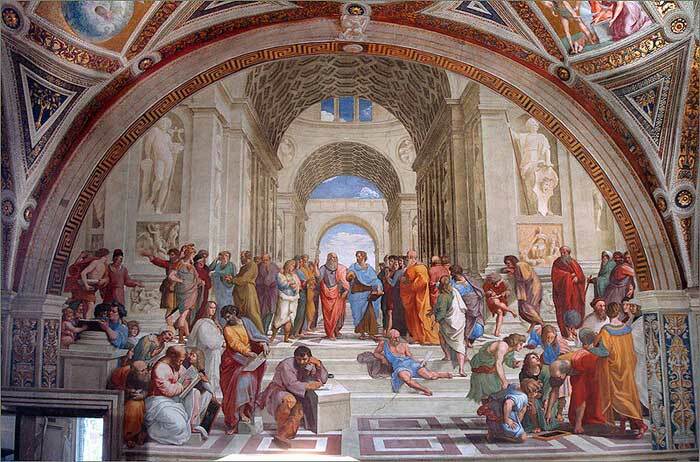 The artist's most famous painting seems to contain various Greek philosophers, notably Plato and Aristotle located in the centre of the picture. 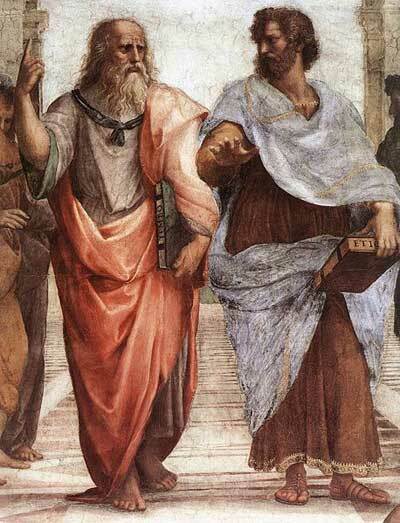 Plato points towards the sky and Aristotle is shown with the palm of his hand turned down. The figure of Plato is a portrait of Leonardo da Vinci. This figure is not on the original cartoons by Raphael, it is a later addition by the artist. The rivalry between Raphael and Michelangelo was intense, Michelangelo had accused his young rival of trying to poison him. 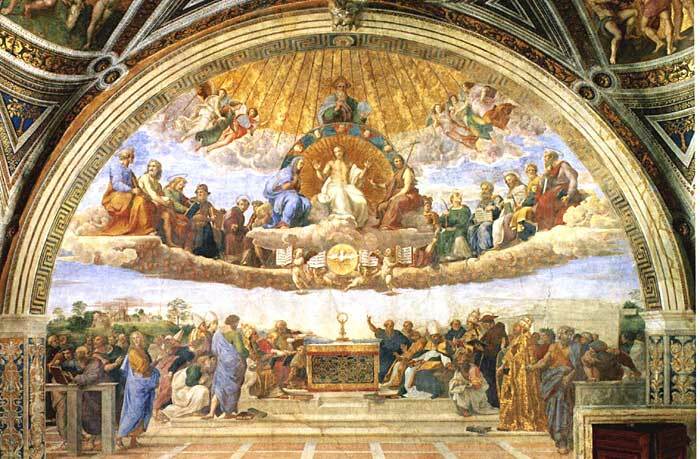 The first part of the Sistine Chapel Ceiling was unveiled, to great acclaim, on August 14th 1511. 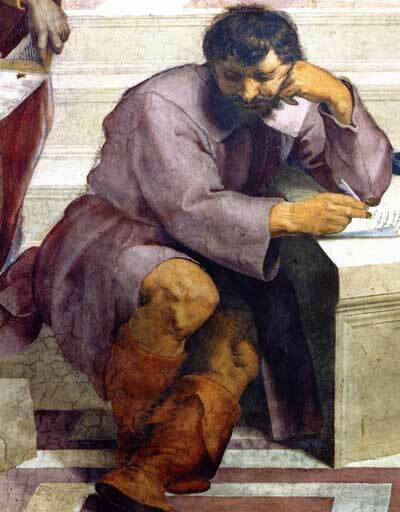 Raphael's reaction was to include a portrait of a weeping Michelangelo as Heraclitus, into this already finished masterpiece, in a parody of Michelangelo's style. The narrative for this painting comes from the story of a German priest who is sceptical about the presence of Christ within the Eucharist. It is only when the host miraculously begins to bleed as the priest is conducting mass that his faith is restored. 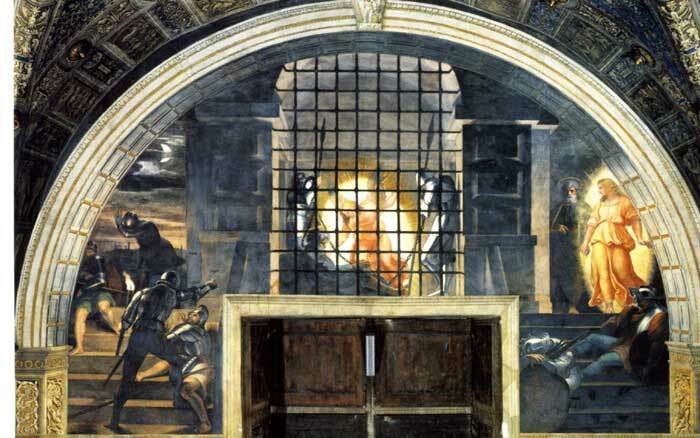 On the right of the painting, St Peter is freed from his prison by an angel who is immersed in a supernatural light. This outshines the natural glow of the moon and dawn sky shown on the left of the painting. 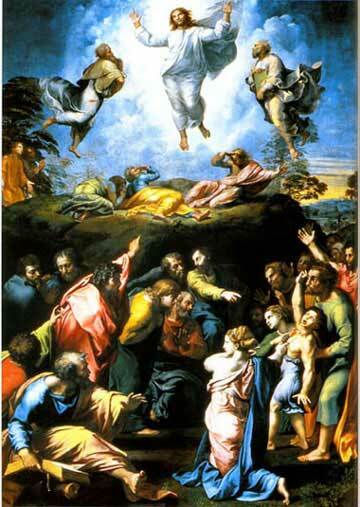 Raphael's vision successfully portrays the drama of the miraculous act. 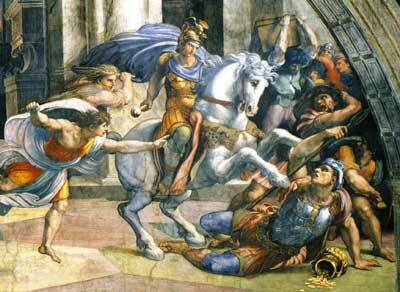 This picture relates to a fire that broke out in 847 in the Borgo area of the city just outside the Vatican walls. 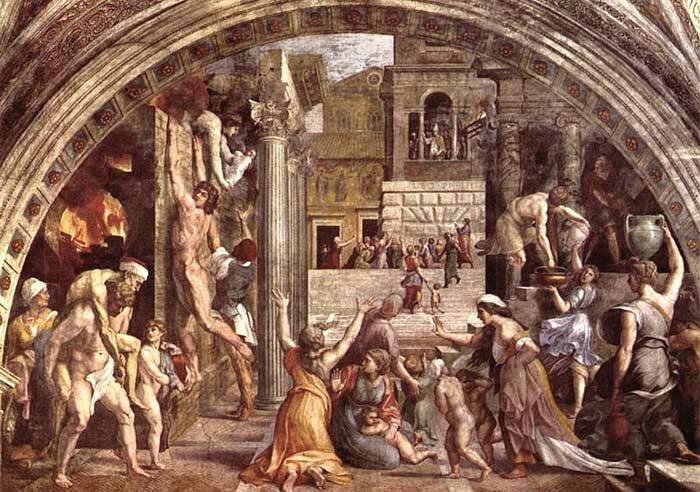 The legend is that the fire was quenched by Pope Leo IV who appears, high in the Loggia della Benedizione, in the background of the painting. 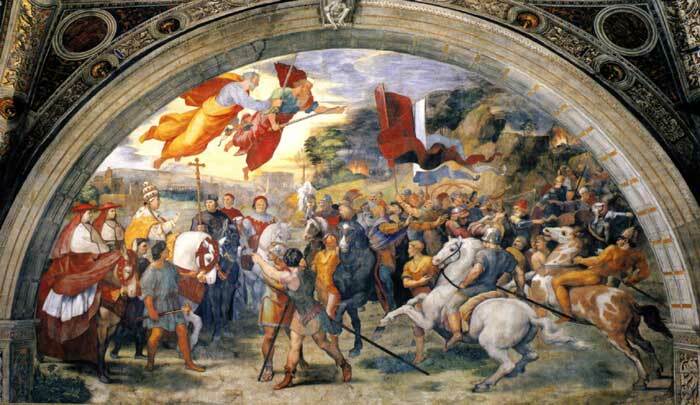 It is the only work in the Stanza dell'Incendio completed by Raphael's own hand. These two details illustrate Raphael's technical ability. The detail on the left shows a male figure who hangs from the wall in an attempt to escape the flames. He looks out at the viewer in what appears to be a staged pose, is this a self-portrait of the artist? On the top of the wall, a distraught mother hands her child to safety as the fire rages nearby. See how well the artist has painted the figure with the pot on her head (detail above) The clothing and the turn of the right foot are particularly well observed, in addition, the garments of the lady in blue add a billowing movement to the frantic scene of destruction. Room VIII, The Vatican 1511-12. 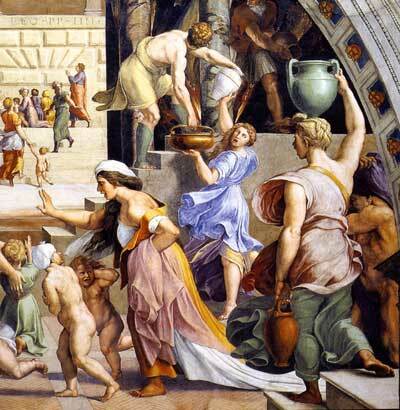 Oil on wood, 1518-20 Room VIII. The Vatican. An absolute masterpiece and one of the artist's last.